The WS Series GL48WS-PS of Wall Mount/Swing Out Enclosures from Great Lakes provides a 19" 310-D compliant mounting in a heavy-duty distribution enclosure. 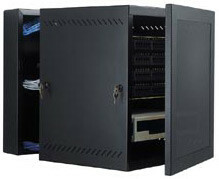 This durable enclosure features a center swing out section for outstanding front and rear access to cables and equipment. A simple finger pull/latch mechanism located inside the enclosure opens the 18.375" deep center swing section.